Two Kairuku penguins come ashore, passing a stranded Waipatia dolphin. Credit: Artwork by Chris Gaskin, owner and copyright owner: Geology Museum, University of Otago. Used with permission. After 35 years, a giant fossil penguin has finally been completely reconstructed, giving researchers new insights into prehistoric penguin diversity. The bones were collected in 1977 by Dr. Ewan Fordyce, a paleontologist from the University of Otago, New Zealand. In 2009 and 2011, Dr. Dan Ksepka, North Carolina State University research assistant professor of marine, earth and atmospheric sciences and North Carolina Museum of Natural Sciences colleague Dr. Paul Brinkman traveled to New Zealand to aid in the reconstruction of the giant penguin fossil. Researchers dubbed the penguin Kairuku, a Maori word that loosely translates to "diver who returns with food." Ksepka was interested in the fossil because its body shape is different from any previously known penguin, living or extinct. He was also interested in the diversity of penguin species that lived in what is now New Zealand during the Oligocene period, approximately 25 million years ago. According to Ksepka, "The location was great for penguins in terms of both food and safety. Most of New Zealand was underwater at that time, leaving isolated, rocky land masses that kept the penguins safe from potential predators and provided them with a plentiful food supply." Kairuku was one of at least five different species of penguin that lived in New Zealand during the same period. The diversity of species is part of what made the reconstruction difficult, and the penguin's unique physique added to the difficulty. "Kairuku was an elegant bird by penguin standards, with a slender body and long flippers, but short, thick legs and feet," says Ksepka. "If we had done a reconstruction by extrapolating from the length of its flippers, it would have stood over 6 feet tall. In reality, Kairuku was around 4-feet-2 inches tall or so." The researchers reconstructed Kairuku from two separate fossils, using the skeleton of an existing king penguin as a model. The result is a tall bird with an elongated beak and long flippers  easily the largest of the five species that were common to the area in that time period. Their results appear in the Journal of Vertebrate Paleontology. New Zealand has a history of producing exceptional fossils that give important insights into the history of penguins and other marine creatures. Ksepka hopes that the reconstruction of Kairuku will give other paleontologists more information about some the other fossils found in that area as well as add to the knowledge about giant penguin species. "This species gives us a more complete picture of these giant penguins generally, and may help us to determine how great their range was during the Oligocene period." More information: "New Fossil Penguins (Aves, Sphenisciformes) from the Oligocene of New Zealand Reveal the Skeletal Plan of Stem Penguins", Daniel T. Ksepka, North Carolina State University and the North Carolina Museum of Natural Sciences; R. Ewan Fordyce, Tatsuro Ando, Craig M. Jones, University of Otago, New Zealand, et al. Feb. 27, 2012, in the Journal of Vertebrate Paleontology. 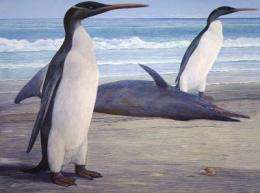 Three skeletons collected from the late Oligocene Kokoamu Greensand of New Zealand are among the most complete Paleogene penguins known. These specimens, described here as Kairuku waitaki, gen. et sp. nov., and Kairuku grebneffi, sp. nov., reveal new details of key elements of the stem penguin skeleton associated with underwater flight, including the sternum, flipper, and pygostyle. Relative proportions of the trunk, flippers, and hind limbs can now be determined from a single individual for the first time, offering insight into the body plan of stem penguins and improved constraints on size estimates for 'giant' taxa. Kairuku is characterized by an elongate, narrow sternum, a short and flared coracoid, an elongate narrow flipper, and a robust hind limb. The pygostyle of Kairuku lacks the derived triangular cross-section seen in extant penguins, suggesting that the rectrices attached in a more typical avian pattern and the tail may have lacked the propping function utilized by living penguins. New materials described here, along with re-study of previously described specimens, resolve several long-standing phylogenetic, biogeographic, and taxonomic issues stemming from the inadequate comparative material of several of the first-named fossil penguin species. An array of partial associated skeletons from the EoceneOligocene of New Zealand historically referred to Palaeeudyptes antarcticus or Palaeeudyptes sp. are recognized as at least five distinct species: Palaeeudyptes antarcticus, Palaeeudyptes marplesi, Kairuku waitaki, Kairuku grebneffi, and an unnamed Burnside Formation species.